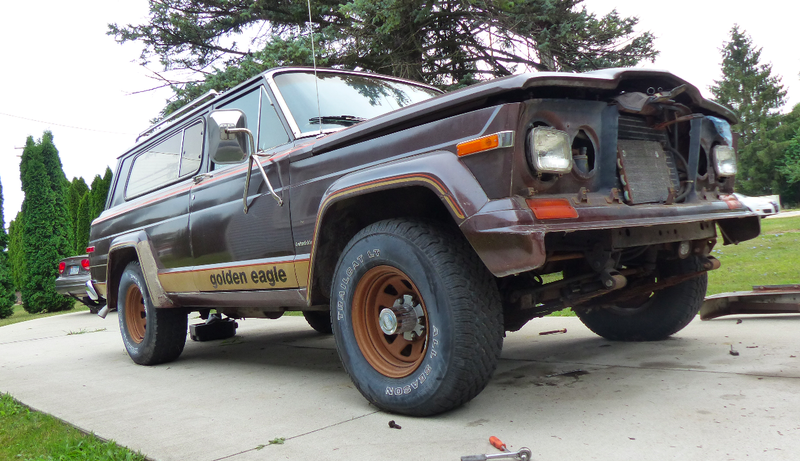 I’m supposed to be taking my 1979 Jeep Cherokee Golden Eagle to the Toledo Jeep Fest in a couple weeks, and while that’s not likely to happen, there is good news: I’ve been saving lots of money on my project by using forums, Craigslist and junkyards. My 1979 Jeep Cherokee is different from any other vehicle in my fleet in that it’s not a neighborhood eyesore. This, combined with the fact that it’s essentially all-original, means I can’t just hack things up, zip tie bits together, and yank out superfluous hoses and trim pieces. I’ve got to do this right. But, as I’ve said before, finding parts for a vehicle as rare as this one could easily put me into the poorhouse, so I’ve had to get creative. First off, I had to figure out what to do about my huge winch bumper, which was hideous and needed to go. After chucking that aside, I was left with an issue: the dealership had apparently hacked off my Jeep’s frame horns to get the winch bumper to fit. So even though I managed to snag a bumper from a North Carolina junkyard for ~$50 (see my friend yanking the bumper off below), I couldn’t install it because the frame provisions were missing. I had a few options to solve this, namely fabbing up some custom brackets or buying some frame horns from folks on forums. But custom brackets would eat up too much time, and the one forum-member who offered me a set of frame horns wanted $50. I’m too cheap to spend $50 on some basic pieces of metal. Yes, they’re crusty. But they’re strong enough to hold on that lightweight aluminum bumper, and I bet with a grinding wheel, they’ll clean up just fine. The next issue I’ve been trying to solve is my cracked and scratched grille. The so-called “pig nose” grille is already not the prettiest in the copious assortment of full-size Jeep faces, so I knew my Golden Eagle deserved an example that was in decent shape. That’s why I initially picked a brand new one up online for $255. It arrived with paint marks on the chrome and a little air bubble under the thin layer of chrome, and because I expect perfection when I spend that kind of coin, I returned it. So then I looked at the grille shown below on Craigslist, and bought the thing for $80 (from a Fiat Chrysler designer, incidentally). It’s far from optimal, with a bunch of oxidation on the chrome and even a crack. As for the crack, I’ve snagged some $4 ABS cement from Home Depot. It should essentially weld that grille back together, and I think the repair will hold up for the life of the vehicle. They appear to be in great shape, and less than $34 shipped per center cap is a great deal. I’ve been searching Ebay for weeks, and couldn’t find a single one that nice for that price if I tried. So there are a few takeaways here. One: If you’ve got a rare vehicle for which parts are pricey, forums, Craigslist and junkyards are your friends. The second takeaway is that you’ll be amazed by how nicely something seemingly hideous will clean up. I thought my oxidized grille was beyond saving, but a bit of time and some polish, and it’s going to look great. I’m hoping that also holds true for my bumper, because it’s in a horrible state right now, and because it’s anodized aluminum, polishing it is pointless without sanding off the top layer. We’ll see how that turns out. As for the important, non-aesthetic bits that are preventing me from driving, I’ve decided to have my old radiator soldered back together because I ran over the replacement I bought at the junkyard. (Note to self: Don’t store car parts in your front yard.) The leak is between the top tank and the core, so I think the job should be straightforward for a specialist, and hopefully less than $50. I’m way behind on my engine. I’ve got to take the cylinder heads off to fix a broken exhaust bolt, and I’m sure I’ll break all the non-sheared ones while I’m at it. When I do get the heads back from the machine shop, painted in a new layer of AMC-blue, and bolted back on, I’ll have a hell of a time trying to figure out which vacuum hoses go where on this smog-era machine. There’s no way in hell this’ll be ready in two weeks. But when it is ready, it’s going to be gorgeous. Hopefully.